Dr. Bryce S. DeWitt, the Jane and Roland Blumberg Professor Emeritus in Physics at The University of Texas at Austin and a leading theoretical physicist, died on Sept. 23 in his Austin home from pancreatic cancer. AUSTIN, Texas—Dr. Bryce S. DeWitt, the Jane and Roland Blumberg Professor Emeritus in Physics at The University of Texas at Austin and a leading theoretical physicist, died on Sept. 23 in his Austin home from pancreatic cancer. DeWitt, 81, was a prodigious scientist whose most recent book for researchers was published last year. He was known for the mature theoretical understanding and elegant mathematical approach he applied to many fundamental physics questions. He directed the university’s Center for Relativity from 1972 until 1987, and helped pioneer the development of the quantum theory of gravity. With Professor Emeritus John A. Wheeler in physics, he also formulated the fundamental equation called the Wheeler-DeWitt Equation that explains how the wave function of the universe works. His other scientific accomplishments included applying his mathematical methods to the so-called “gauge” theories, which have been used to describe the forces that act on elementary particles. His interest in educating others led DeWitt to write comprehensive scientific articles about the quantum theory of spacetime and other subjects. These included lay articles to explain quantum mechanics and the structure of matter and energy. In addition, DeWitt traveled overseas regularly to collaborate with scientific colleagues, and lectured extensively into the mid-1990s in France, Italy, Iran and elsewhere. His research activities included a scientific expedition in Mauritania in 1973, where he and his wife, Dr. Cecile Dewitt-Morette, led a scientific study to test the validity of Einstein’s general relativity theory of gravity during a total solar eclipse. The study came after 30 similar attempts, and required the couple and other university physicists and astronomers to obtain telescope-based photographs of stars located during the eclipse, when their light would not be buried by that of the Sun. When compared to photos of the same stars taken after sunset six months later, the photos revealed that the Sun’s gravity had pulled the stars’ light slightly out of their original paths as Einstein predicted. DeWitt received an undergraduate (1943), a master’s (1947) and a doctor’s (1950) degree in physics from Harvard University, which he chose over the California Institute of Technology because of his passion for rowing. He also was an avid mountain climber and hiker in the Himalayas, Africa and elsewhere. After serving a year and a half as a naval aviator during World War II, he performed research at the Institute for Advanced Study in Princeton, N.J., where he met Dr. Dewitt-Morette, who holds the Jane and Roland Blumberg Centennial Professor Emeritus In Physics at The University of Texas at Austin. After conducting research at institutes overseas, the two returned to the United States in 1952. He served as a senior research physicist at Lawrence Livermore National Laboratory for three years and became an expert on hydrodynamical computations. In 1956, the couple joined the University of North Carolina at Chapel Hill, and DeWitt became a professor there six years later. The couple joined the University of Texas at Austin faculty as professors in 1972, where DeWitt’s studies included applying his Lawrence Livermore expertise to computing the behavior of colliding black holes and other astrophysical problems. He became the Jane and Roland Blumberg Professor of Physics in 1986 and an emeritus professor in 2000. DeWitt’s honors include receiving the Dirac medal from the Salam International Center for Theoretical Physics in Italy, the Pomeranchuk Prize of the Institute of Theoretical and Experimental Physics in Moscow, the Marcel Grossman Award (jointly with Cecile DeWitt-Morette), and election to the National Academy of Sciences and the American Academy of Arts and Sciences. 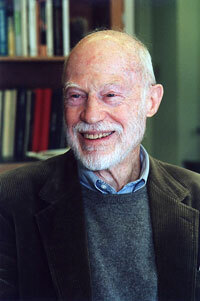 He was recently named as the 2005 recipient of the Einstein Prize of the American Physical Society. A memorial will be held in April 2005 in Tampa, Florida, and in Austin, Texas, in conjunction with the award ceremony (a link to additional information will be posted in the future). He is survived by his wife and four children. For more information contact: Barbra Rodriguez, College of Natural Sciences, 512-232-0675.